Antigua and Barbuda present an array of non-governmental organisations (NGOs) and civil society organisations (CSOs) which cover various aspects of the country’s infrastructure. In correspondence with these NGOs and CSOs, are trade unions which play a large part in assisting the workers of Antigua and Barbuda. 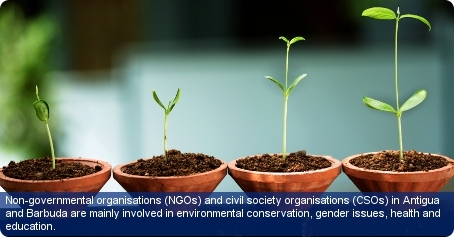 NGOs and CSOs in Antigua and Barbuda are mainly involved in environmental conservation, gender issues, health and education. Environmental organisations like the Environmental Awareness Group (EAG) have played a major role in promoting the conservation of Antigua and Barbuda’s wildlife and natural resources. The EAG organises field trips for businesses and schools and is involved in providing advocacy and training to individuals, companies, tourism businesses and community groups. Other prominent organisations include the Antigua Planned Parenthood Association which promotes family planning and contraceptive methods; social welfare groups that work with the Directorate of Gender Affairs to increase women’s awareness of their rights and provide safe havens for sexually and violently abused women and; various other NGOs and CSOs that work to promote societal wellbeing in education and health. Established in 1939 is Antigua and Barbuda’s historic trade union centre: the Antigua and Labour Union (ATLU). Since 1951, various Unions which accommodate an array of the working public through different professional sectors have been officially registered under the Trade Union Act.